(WBIR - KNOXVILLE) One woman is dead after a two-vehicle crash on John Sevier Highway on Wednesday afternoon. Shana Young, 38, of Hurricane Mills died while being treated due to injuries sustained in the crash. Knoxville police officers responded to the crash on John Sevier Highway at the intersection of Norton Road and Mountain Grove Drive around 4:26 p.m. Wednesday. (WBIR - KNOXVILLE) South Knoxville's Island Home Avenue did not reopen Monday as planned. The street was originally supposed to open on November 13, but rain delayed those plans. The city set another deadline of November 30, but even more wet weather is causing another delay. The city has given the contractor another extension, so the new target date is December 18. 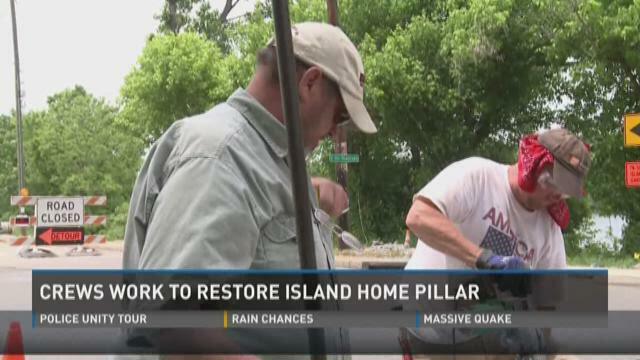 (SOUTH KNOXVILLE - WBIR) Crews on Tuesday worked to repair a 100-year-old pillar at Island Home Park. The column was destroyed after a truck driver crashed into it last week. Knoxville police are looking for the rightful owner of a miniature horse found grazing on someone's South Knoxville yard. KPD Animal Control said they responded to a call at the 5100 block of Rebecca Lane on Thursday morning. The officers could not find the owner, and neighbors - pun intended - weren't sure where the female mini horse came from. She's being taken care of by Young Williams Animal Center until the owner can be located.